The West Indian: Char sliced pineapple on the grill, then dice and mix with grilled onions, poblanos, Scotch bonnets, brown sugar, lime juice, candied ginger, and fresh mint. The Tuscan: Fire-char cherry tomatoes and green onions. Dice and mix with diced smoked mozzarella, slivered basil, olive oil, lemon juice, and salt and pepper. The Asian: Flash-smoke cucumber, fresh chiles, and green onion for about 10 minutes. Dice, then add fresh ginger, sesame seed oil, sesame seeds, cilantro, rice vinegar, brown sugar, and soy sauce. Add salt as needed. 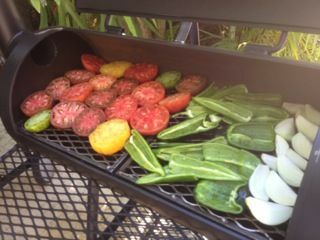 Do YOU have a smoked or grilled twist on salsa? Pray tell!